Food pantries in the state have been able to supply those in need with some vegetables this season there were grown by expert gardeners. Iowa State University’s Susan DeBlieck, says the Extension Department’s Master Gardener program partnered with the research farms to create donation gardens. “We partnered with our SNAP education staff to make funding available. 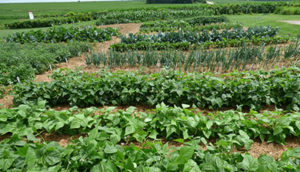 Some of the funding available supported these donation gardens that were planted at seven of the Iowa State University research farms,” DeBlieck explains. SNAP stands for Supplemental Nutrition Assistance Program, and DeBlieck says the Extension Education and Outreach Program provides education for low income families on how to prepare produce. The gardens were tended throughout the summer by Master Gardener volunteers who harvested seven-thousand pounds of vegetables. “All of those pounds of produce have been donated to nearby food pantries and food banks,” according to DeBlieck “And these demonstration farms are located all across the state and are really helping to build food security in particularly in rural areas.” The gardens are located in Rock Rapids, Lewis, Kanawha, Ames, Nashua, Fruitland and Crawfordsville. The Iowa State Extension program has a long history of using demonstration gardens to help educate, and DeBlieck says this program fits in well with that tradition. “I believe that those started in the 1970’s and since that time we’ve been demonstrating different types of crops and different types of growing methods,” DeBlieck explains. “And so we chose crops that are wanted by food pantries. They are foods that store well, are easy to grow in Iowa, and look good on a food pantry shelf.” She says many of the vegetable you probably grew in your own garden. They are green beans, sweet potatoes, cabbage, green peppers, tomatoes, broccoli, potatoes, zucchini, beets, cantaloupe, garlic and carrots. The food banks and pantries are expected to benefit from the educational demonstrations at the gardens. She says people who came out to the research farms got to learn about the things they could grow to donate to the local food pantry. You can find out more information about the demonstration programs and how you can become a Master Gardener online at: www.extension.iastate.edu/mastergardener.